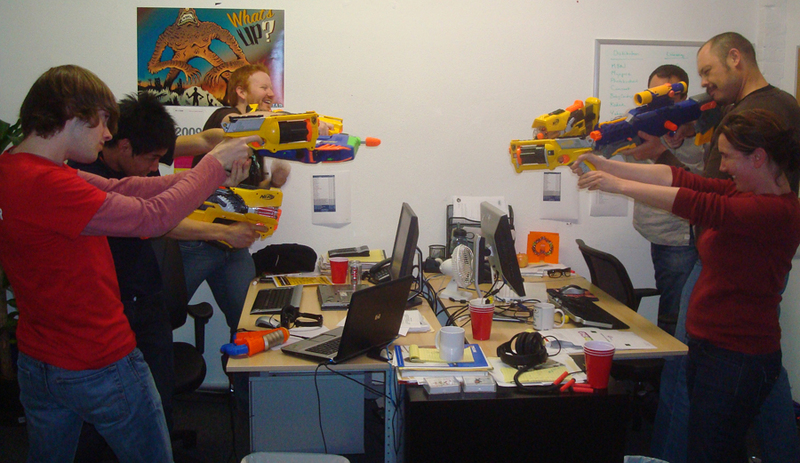 Here at JibJab, any given moment in the day can go from tranquil web programming to all out inter office warfare. We have a small arsenal of Nerf guns at our disposal, with ammunition stationed at different locations all over the office. Of course, when you’ve got this much ammo flying about on a daily basis, you pick up a few tricks to avoid the sharp sting of suction cup. Joey here has been known to dodge foam bullets. Whoa. This entry was written by paulhanges and posted on March 6, 2009 at 5:44 pm and filed under Uncategorized. Bookmark the permalink. Follow any comments here with the RSS feed for this post. Post a comment or leave a trackback: Trackback URL. Thank you for going through all of this craziness for us, the JibJab consumers. All the Nerf projectiles that could put out an eye. And, no doubt the excessive laughter that can bring on tears, wet pants, even hernias.